In today's world, everyone wants access to information from his or her personal mobile device. As a business, this includes your customers and/or employees. What if the information they want access to is highly sensitive? While it's tempting to resist these pressures for security reasons, providing mobile access can be a significant competitive advantage and most importantly keep your customers and employees happy and productive. The reality is that in order to survive in a connected world, we must provide a way to meet these demands without sacrificing security. 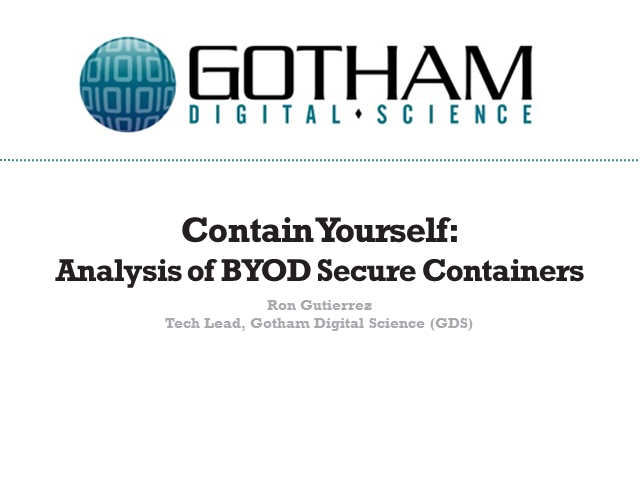 Organizations have begun moving from "managed devices" to a Bring Your Own Device (BYOD) model where company resources can be accessed and stored on unmanaged devices. As you can imagine, there are some inherent risks with this approach due to the organizations inability to enforce policies on personal devices. There is currently a huge market for solutions that allowing enterprises protect their data on unmanaged devices. Enter "Secure Containers” and “Application Wrapping". The basic premise of these solutions is that it allows organizations enforce policies at the application layer rather than the device layer. For example, authentication, remote wipes, lockouts and data encryption can now be enforced on a per application basis. Application Wrapping is a technique, which allows the ability inject their own code into existing iOS applications. Once injected, existing iOS method implementations can be overwritten to enforce these policies. In a nutshell, you can have an existing application and have it wrapped so that it enforces various defined policies and secure it without developers having to manually implement it.